Public Libraries have always been at the forefront of social development and social inclusion. They will continue to underpin education, learning and self-development; bridge the gap between the 'haves' and 'have nots' of the information age; and play an increasing role in the modernisation and delivery of public service and participative citizenship. The Government-funded People's Network will connect all public libraries to the Information Superhighway by 2002 - delivering the benefits of lifelong learning to every citizen via the new Information & Communication Technologies (ICT). Books and ICT will continue to complement each other in providing the widest and best services to users - at the heart of each and every community. 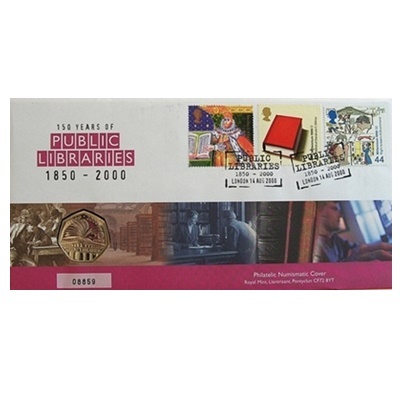 The Royal Mint and the Royal Mail are proud to mark the 150th anniversary of The 1850 Public Libraries Act with a commemorative PNC. The PNC includes the libraries fifty pence coin, its special reverse design depicts the turning pages of a book above the pediment of a classical library building, the facade decorated with CDs to give it a modern perspective. 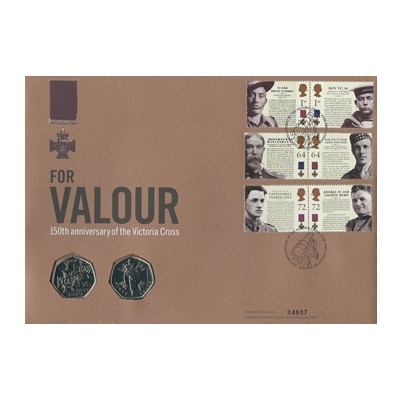 The beautifully illustrrated stamps are in keeping with the purpose of libraries, free knowledge and education for all. The stamps shown are King James' Bible, The World of Literature and The Right to Learn. Issue Limited for PNC is 35,000.